Voltage Selection 120 volt or 240 volts Which is Better? When it comes to MIG Welding Safety, there are a few items you must have to protect yourself from the dangers of welding. These include a proper helmet, leather gloves, and protective clothing. Safety precautions shouldn’t be taken lightly; MIG Welding can be far more dangerous than you would imagine if proper safety procedures are not adhered to. Possibly the greatest danger for a MIG Welder is the ultraviolet rays emitted from the welding process. You may not even realize the damage that occurs from exposure to ultraviolet rays at the time it occurs, but you will certainly feel the pain the following day. And even worse, the permanent damage that can result from the exposure. The only way to properly protect your eyes when welding is by wearing a suitable welding helmet. The lens itself will filter out the UV rays to protect your eyes, while the solid face of the hood will protect your skin. 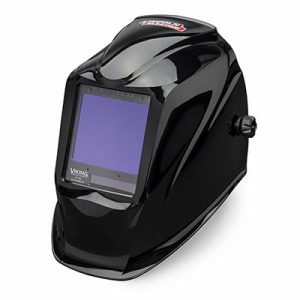 Learn more about the features of welding helmets and our recommendations in our auto-darkening welding hood mini reviews article. Welding creates heat, a lot of heat. When you think about it, the process of welding actually melts the steel and the melting point of steel is well over 2500 degrees Fahrenheit. So you need gloves to handle the hot parts as well as protecting your hands from weld spatter. The same UV rays that can damage your eyes can also damage your skin. If you wear a short sleeve t-shirt and operate a MIG Welder for a couple of hours, you will end up with the worst sunburn you have ever experienced. Far worse than the sunburn from a day at the beach. Wearing a quality pair of leather welding sleeves or other fire retardant sleeves, will also protect your arms from welding spatter and heat. This should go without saying, but I’ll say it anyway. You should never weld in the rain or in a wet environment. The reasons should be obvious but for a newbie welder, you may not think it through. The process of welding occurs as electricity moves from your MIG machine through the metal parts, and to ground. This is why you can’t weld unless you attach a ground clamp to the parts. The danger of welding wet parts is that you may become the ground and suffer the effects of an electrical shock. Not a good thing! It is imperative that you cover 100 percent of your skin to shield your body from the UV rays and avoid a dangerous burn. Some of the most common mistakes are leaving your shirt or coveralls unbuttoned. Doing so will lead to a beet-red burn in the shape of triangle just below your neck. Another venerable area is the front of your arms in the bicep area if you don’t wear sleeves. Quite often you will employ a helper to hold metal parts in position while you tack them in place with the MIG Welder. This is especially true when building a race car. Make sure your helper is wearing gloves and most importantly dark glasses. They may think they can simply close their eyes, but trust me, your eyelids won’t keep out the UV rays. Just ask my crew chief who spent 2 days wearing eye patches after we tacked a chassis together one day.